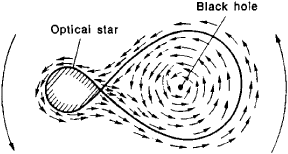 When a star dies, gravity can collapse the remaining dead star core to become a black hole. The new discovery means that black holes can be created on their own and are probably quite common. If the two black holes formed from two stars that began life together as a binary system, then they'd likely be spinning at roughly the same angle as their orbital motion. Such a black hole binary system is a distinct possibility in Markarian 1018, since it's the product of a major merger of two galaxies - each of which probably had a supermassive black hole at its core. According to the scientists' calculations, black hole mergers sing when the larger black hole is rotating just below the limit, at 99. A study result shows that the mass of a supermassive black hole is approximately proportional to that of the central part of the galaxy (galactic bulge). The black hole universe does not exist the horizon problem, so that it does not need an inflation epoch. X-ray pulses are common among smaller black holes, but the Durham research is the first to identify this activity in a super-massive black hole. SCIENTISTS at Durham University have found the "missing link" between small and super-massive black holes. Merritt and his colleagues determined how fast a black hole has to move to escape a galaxy's gravitational field completely. The first pathway to a binary black hole starts with pairs of stars born together.